in the Now, say yes to the Now, allow it to be as it is and don’t resist it. Eckhart Tolle is today a world celebrity, thanks to the endorsement he has received from Oprah Winfrey who held a webcast for 10 weeks to discuss his book A New Earth, attracting an audience of several millions. Life Positive has always endorsed Eckhart Tolle, and held him in the highest respect. 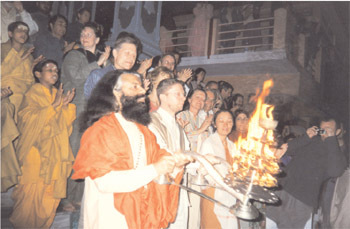 We therefore carry a detailed report of a retreat he held in 2002 in Rishikesh. One day in November 2001, Arthur from Vancouver dropped by at my place. He was a friend of a friend and had a book with him: Practising the Power of Now by Eckhart Tolle. I read the first page and was immediately taken in. Eckhart expressed the perennial wisdom in amazingly clear and simple terms. End of December, however, I slipped from the waiting list into the list of participants. There had been many cancellations due to the terror attack on the Indian Parliament on December 13, 2001, and the build-up of troops along the border with Pakistan. Around 130 persons mainly from English speaking countries from Hong Kong to Hawaii gathered in the spacious Paramarth Ashram on the banks of the Ganges. There were only about 20 from India. Eckhart reached the ashram with a group of people, some of whom I happened to know – for example, KimEng from Vancouver. I had met her in Mumbai a couple of years ago and again in Thiruvannamalai and Pondicherry. Kim, a beautiful woman of Chinese origin, was now Eckhart’s girlfriend, and certainly had not guessed what destiny held in store for her. An Englishman tried to trace his room key which he had handed over to a watchman who was nowhere in sight, and I helped him out with my Hindi. His name was Philip and he had lived with Eckhart in the same house, when the latter was still in Glastonbury in England writing his famous book, The Power of Now. Eckhart’s presence seemed to have rubbed off on Philip. He exuded great calm and love. My difficult life situation at that time suddenly hit me: I had left my guru in South India and in the process, had lost my friends and the structure in my life. I had moved to a new place, and to top it all, the magazine for which I had mainly written, had recently closed down. I felt without any purpose in this world, and confided it to Philip. “Great!” he said. “You couldn’t have a better starting point for the retreat with Eckhart.” I knew he was right. When the ego can’t hold on to the old, anyhow false, identities any longer, there is a chance that it gets weakened and finally disappears. Indian wisdom and Eckhart’s retreat have only this one aim: to realise that we are not the apparently separate, illusory ego-person with its life story, which is entirely based on thoughts. When the illusory ego is not projected anymore, the real Self shines forth. Nothing else is needed, because the real Self is always there already. It is hidden beneath the ego, as the ocean is hidden beneath the waves, or the rope beneath the snake, or the desert sand beneath the mirage, or the gold beneath the ring. “Observe how it feels inside right Now. Just feel, without thinking or judging,” Philip suggested. It helped. I slipped out of the grip of the sombre thoughts. The emotional turbulence gave way to a peaceful awareness of the moment. Eckhart explained at the retreat that old, painful behaviour patterns, like sadness or anger, often get stronger, when the awareness in the Now increases. The ego wants to sabotage the process of becoming aware. It wants to survive and strengthen itself, and it survives and gets strengthened, when it lures us to fully identify with thoughts and feelings. Eckhart defines the ego or phantom self, as he sometimes calls it, as the unobserved mind. The stress is on ‘unobserved’. It determines one’s life completely, as long as one is not present as the observing consciousness. Then one is not ‘there’ and reacts unconsciously according to the strategies of the ego. There is no choice and one has to be angry or sad or resist the moment in some other way, because “the ego feels better if it is against something”. The ego, however, is in a weak position if I know that I am sad or angry. Then it can’t order me around anymore. I am suddenly awake and have the choice whether I want to allow dark thoughts and feelings to take hold of my mind. And who would voluntarily choose to be unhappy? Eckhart claimed that painful emotions surfacing constitute an opportunity. If one is present in the Now when waves of painful emotions arise and accepts them, and their periodic dominance, the ego loses more and more of its strength. It is of immense value and a fundamentally different way of life to consciously accept the Now. It is the state of an enlightened being. “An enlightened being is always completely at one with the present moment and doesn’t put up any resistance towards it,” says Eckhart, possibly describing his own state. He gave the analogy of swimming: As long as the ego dominates, the person can be compared to someone who is learning to swim. He wildly splashes around in the water, exhausts himself, is frightened, and fights to keep his head above the water. The water is his enemy. He doesn’t trust it. In a similar way, the ego sees the whole universe as an enemy and keeps fighting it. However, noticing that one is unconscious is the crux of the matter and not really within one’s power. Eckhart often attached the rider ‘if you can’, when he asked us to be present. You cannot ‘do’ it, but you can allow it, he said. Allowing things to be as they are may seem trivial, but it opens up a completely different quality of life. Eckhart claimed that a depressive mood was easier to ‘catch’ with awareness than anger. It arises more slowly with slow, heavy thoughts. Anger, however, suddenly leaps up like fire. One is immediately identified with thoughts, and not aware of it. Most people live with a mind-created self, with which – if it had been another person – they wouldn’t live for a single day, laughed Eckhart. They even address it as “you.” “What a fool you have been!” for example. Some try to improve this self and paste stickers: “I am okay” or “I love myself” and read them many times a day. It will help only to a certain extent. In the world of duality, the other pole will show up at some point and then you won’t feel okay or you will hate yourself, explained Eckhart. Yet there is a solution and he put it across with great intensity and urgency. To allow the present moment to be as it is, to accept it in whatever form – inside and outside – it may present itself – even if it is not the ideal. It is not easy to recognise the Now as it truly is. Most people consider past and future more important than this small, fleeting moment which can’t be grasped. Yet Eckhart doesn’t refer to a point in time, when he speaks about the Now. The Now is not in time. It is a completely different category from past and future. Everything always happens in the Now. Nothing happens in the past and future, and nothing can happen in the past and future. Past and future are only thoughts in the mind, and they are there Now. Past and future borrow their reality from the Now, as the moon borrows its light from the sun. Learn from the past and plan for the future, but honour the Now, live in the Now, say yes to the Now, allow it to be as it is, and don’t resist it. The Now is your faithful companion. It is always with you and never forsakes you. It is eternal, always the same, infinite and sacred. And Eckhart even went a step further. “You are the Now”, he perplexed us. The ego doesn’t like the Now. It knows that it can’t survive in the Now, because it needs past and future for its story and requests the Now: “Please, dear Now, don’t stop me. I am on my way to the future.” Eckhart laughed. It would be funny, if it wasn’t so tragic: almost all of mankind waits perpetually for fulfilment in the future. Almost everyone steadfastly ignores the Now, the present moment, in which life happens. Almost everyone wants to get away from the Now, wants to be somewhere else, wants to be with somebody else, wants to do something else, and wants the future to come quickly. On the other hand, everyone is afraid of it. Yet the future comes always only as Now. Only Now can you feel what you truly are, and what the essence of all is – and only when you are fully that, will you be happy, Eckhart claimed. Outer circumstances won’t make you happy in the long run. It is a truism that each generation doubts anew to its own detriment. What is this truth that we essentially are? Eckhart quoted from the ancient Vedas: not that what the eyes see, but that by which the eyes can see. Not that, what the ears hear, but that by which the ears can hear. Not that, what the mind thinks but that by which the mind can think. Words and thoughts turn back from it, Indian wisdom adds. It is not about knowing something but about being truly oneself. Being can’t be understood by the mind. Yet it can be felt. And enlightenment is, says Eckhart, to regain awareness of being and to abide in it. Eckhart didn’t say anything new. ‘To be present in the Now’ is known in the Indian tradition as ‘witness consciousness’. Yet his talks had great impact, maybe because for this truth to really touch the listener, it has to be conveyed by someone who is fully present – a true guru. Eckhart certainly was such a guru in Rishikesh. I hope that he remains firmly rooted in being in spite of having been catapulted into the limelight in recent years. Enormous adoration is coming his way since the tremendous success of his books. The danger of it going to his head and activating a ‘spiritual ego’ is real. “As soon as a spiritual teacher considers himself as someone special – and his followers usually project that he is indeed very special – he is not transparent for Being anymore,” Eckhart himself told us. Being is not partial. It doesn’t prefer Eckhart over others, but reveals itself wherever it is not getting blocked by an ego. In Eckhart it revealed itself in Rishikesh, because Eckhart was not there anymore. Eckhart appeared modest and endearingly awkward. One of the organisers took him by his arm and led him to his chair. He walked with bent shoulders and sat down slowly and carefully so as to not knock down the microphone. Then he kept silent for a while and just looked at us. Eckhart recounted at the retreat that someone once asked him what he had achieved in life. At that time he had not yet written his book, had no job and had achieved nothing in the eyes of the world. Ordinarily, thinking takes on the role of a tyrant. It pushes us to think and think, drags us into negative thought patterns, and makes us even believe that we want it that way. We are missing out on the ever present, fulfilling, ‘real’ life. “Ninety per cent of your thinking is unnecessary,” Eckhart claimed. Create a pause in the thought stream, for example by consciously taking a deep breath, or by intensely listening to the chirping of birds. And feel the inner energy field of the body and become one with it, especially before sleeping and right after waking up, he advised. There are warning signals which inform you that you are not present in the Now – for example if you are irritated, impatient or unhappy or if you complain about something, even about the weather. “If you are fully present in the Now, it is not possible to be unhappy,” he stated. At the end of the retreat each participant got the chance to stand before Eckhart for a few seconds and silently look into his eyes. As soon as one could feel an opening or expansion inside, Eckhart smilingly nodded, folded his hands and slightly bowed: “Namaste”. Maria Wirth, German, planned only a stopover in India in 1979. She is still here (presently in Dehradun). Reason: India’s spirituality which she feels has no equal.